A serial cat killer may be on the loose, Washington state law enforcement officials are saying after discovering a 13th cat Friday in a string of brutal mutilated cat murders. A few days after the number of mutilated cats reached a dozen, officials now say a 13th cat has been found. 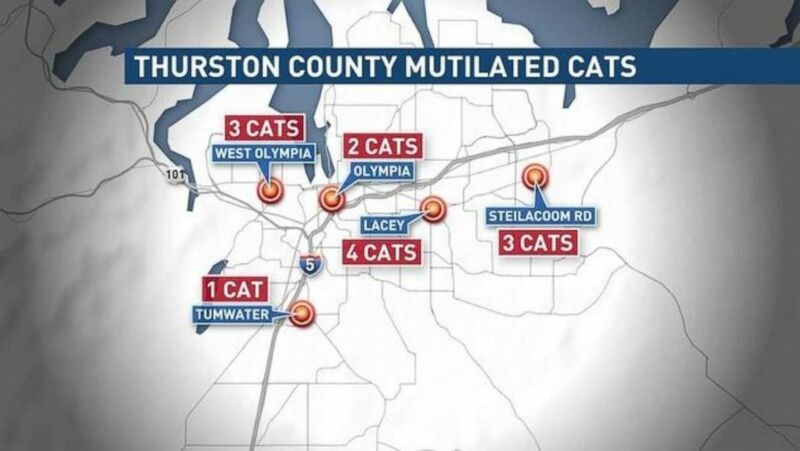 The 13th killed and mutilated cat was found in Lacey, Washington, in Thurston County, the same location as the previous 12, Lt. Tim Rudolff with the Thurston County Sheriff's Office told Seattle ABC affiliate KOMO. "She would go on walks with me," owner Paul Braget, who found the kitten as a stray and raised her to adulthood, told KOMO. "She was a good cat." Braget believes his cat was taken sometime late Thursday or early Wednesday when his neighbor's dog began barking at something, or someone, outside. Thirteen cats have been found dead and mutilated in Thurston County in Washington state, according to officials. A $30,000 reward is being offered for finding the person responsible. The 12th cat was found in a field on Pacific Avenue SE, near the popular Chehalis Western Trail in Olympia, according to KOMO. Investigators believe that all the cases are connected because of how the cats were mutilated, KOMO reported. As ABC News previously reported, the cats were found cut open with their spines removed, according to Erika Johnson, an animal cruelty services investigator for Thurston County Animal Services. They were apparently cut open with a scalpel, she added. DeTray said he discovered the cat after a swarm of flies and bees caught his attention, and he went to check out why they were gathered in one place. "When it actually happens and you find it, that's a completely different story. It really hits home,” DeTray said of finding the cat. Earlier this month, a deaf tabby cat named Harley was found by its owner's neighbor in West Olympia, not far from where another cat was found just a week earlier. "The cats are usually left in public places after they are killed," non-profit organization Pasado's Safe Haven said in a statement in early August. "Investigators believe these cases are linked due to similar mutilations done to the cats' bodies." Pasado's Safe Haven is offering a $30,000 reward for information leading to an arrest and conviction in the case.